The grow lights market was valued at USD 2.50 billion in 2016 and is expected to reach USD 5.11 billion by 2022, at a CAGR of 11.86 % during the forecast period. Grow lights can be efficiently used to grow crops and vegetables indoors in any season. However, these crops would require artificial lighting for photosynthesis, which may not be favorable in a particular region due to extreme climatic conditions. A grow light is an electronic lamp designed to accelerate plant growth by emitting electromagnetic spectrum ideal for photosynthesis. The technological innovations has led to the development of a variety of grow lights according to the requirements of the plants. Base year considered for study is 2016 and the forecast has been provided for the period between 2017 and 2022. Legalization of growing marijuana in the U.S. The governments of several countries have launched different policies that has led to the growth of LED industry. In October 2014, the Government of India initiated a drive in which LEDs replaced 750 million incandescent bulbs. Under the project “Prakash Path”, Prime Minister Narendra Modi encouraged the use of LED lights for street lights and for residential, commercial, and government buildings. The LED lamp government procurement business model was jointly launched in 2015, by the Bureau of Energy Efficiency under the Ministry of Power, India SSL and Energy Efficiency Services Limited (EESL). This research study involves an extensive usage of secondary sources, directories, and databases (such as Hoovers, Bloomberg BusinessWeek, Factiva, and OneSource) to identify and collect information useful for this technical, market-oriented, and commercial study of the grow light market. To find the overall market size, top-down and bottom-up approaches have been used to estimate the sizes of other individual markets by using percentage splits from secondary sources such as Hoovers, Bloomberg BusinessWeek, Factiva, and OneSource as well as with the help of primary research. The entire procedure includes the study of the annual and financial reports of the top market players and extensive interviews of industry leaders such as CEOs, VPs, directors, and marketing executives for key insights (both qualitative and quantitative) pertaining to the market. In January 2017, LumiGrow Inc. launched its new product Pro Series E Horticultural lighting solution with cloud-based wireless control. With the help of SmartPAR Wireless Control system, lighting can be managed easily from computers, tablets, and smartphones. Philips Lighting entered into a partnership with Light4Food B.V. (Netherlands). Light4food a producer of closed cultivated systems together with Royal Philips is expected to offer LED lighting solutions for vertical farming and greenhouses. 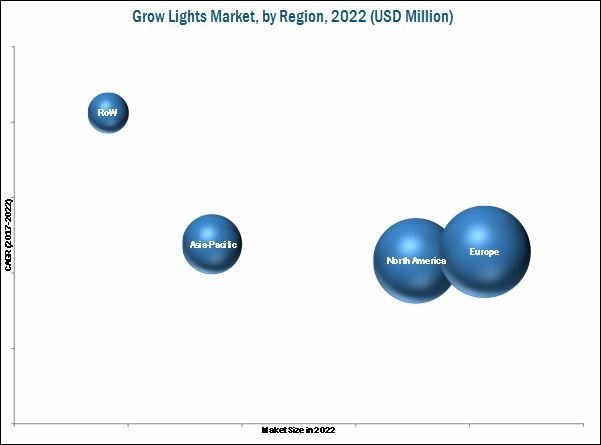 The grow lights market comprises key manufacturers such as Royal Philips (Netherlands), General Electric Company (U.S.), Osram Licht AG (Germany), Gavita Holland B.V. (Netherlands), LumiGrow, Inc. (U.S.), Heliospectra AB (Sweden), Transcend Lighting Inc. (U.S.), and Sunlight Supply Inc. (U.S.); and raw material suppliers such as Beacon Lighting India (India); end users such as Walters Garden, Inc. (U.S.), Green Sense Farms (U.S.), and Borst Bloembollen B.V. (Netherlands); and suppliers such as Shenzhen Juson Technology Co., Ltd. (China). 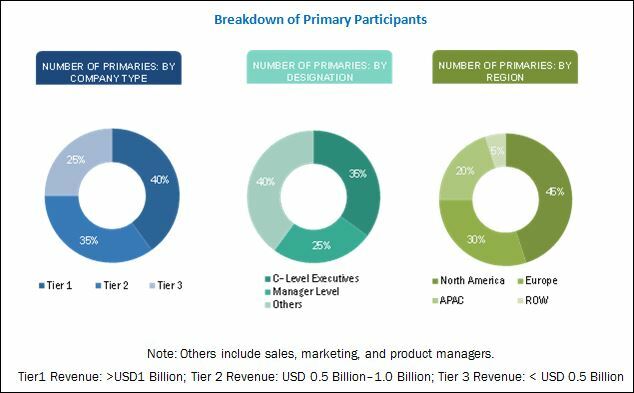 In this report, the overall grow lights market has been segmented on the basis of technology, installation, application, spectrum, and geography. This market is segmented on the basis of technology, installation, application, spectrum, and geography. The applications include vertical farming, indoor farming, commercial greenhouse, turf and landscaping, and research. Among all these applications, commercial greenhouse held the largest market share in 2016. On the basis of technology, the grow lights market has been segmented into high-intensity discharge (HID), fluorescent lighting (FL), light emitting diode (LED), and other lighting technologies (induction and plasma lighting). Traditional lighting technologies such as high-intensity discharge (HID) and fluorescent lighting (FL) are quite popular among commercial growers as well as hobbyists. LED grow light is a new technology in horticultural lighting and is proving to be far more effective than other lighting technologies. Though LED grow lights are expensive, their long-term benefits in terms of energy efficiency make them an ideal option for indoor plant cultivation. The grow lights market, on the basis of installation, has been segmented into retrofit and new installations. The market for retrofit installations is likely to hold a larger market share in the coming years. In the context of the grow lights market, retrofitting is defined as removing an existing grow light and installing a new one, either of the same lighting technology or of a different lighting technology. New installations are generally characterized by the expansion of existing facilities or setting up of a new facility, such as a new greenhouse or a vertical farm. Europe was the leading market for grow lights in 2016. Within Europe, the Netherlands is a leading exporter of horticultural produce, grown within its numerous automated commercial greenhouses. The concept of vertical farming is also gaining popularity in Europe. The rising population in Europe is a major driver for the increasing need to practice indoor horticulture in this region. Also, the severe cold in winters and insufficient sunlight in parts of Europe mandates indoor growing with the help of artificial lightings. North America was the second major market for grow lights in 2016. The emergence of vertical farms and the booming market for cannabis cultivation are driving the demand for grow lights in this region. The initial capital required for the purchase of good-quality LED grow lights is higher compared to that of conventional lighting technologies such as FL and HID. This is mainly because each LED grow light unit contains arrays of LEDs, specially designed for horticultural applications. Often, these units contain different types of LEDs with variation in watts and wavelengths to provide a broad range of light spectrum and intensity for different types of plants. High-powered LED grow lights are available in the market for prices starting from USD 500. A high-powered induction grow light also costs USD 1,300 or more, whereas high-powered plasma grow light costs around USD 3,000. The costs of these grow lights are higher compared to that of a 1,000 watt HPS light, which costs between USD 100 and USD 150 and provides sufficient light for photosynthesis. This significant price difference is restraining the growers to adopt energy-efficient grow light technologies such as LED, induction lighting, and plasma lighting. Royal Philips (Netherlands) holds a leading position in the grow lights market and is a recognized brand in the lighting and illumination business; it offers a diversified product portfolio for horticultural applications. The company has developed innovative products to cater to the horticultural lighting markets by combining its expertise in lighting technologies with inputs from plant psychologists. Its products come in a variety of shapes, with a range of lumen outputs, which are offered at various price points to suit a wide range of growers from hobbyists to commercial growers. The company mainly focuses on partnering and collaborating with other companies to grow in the LED grow lights market. For instance, Philips partnered with Dummen Orange (Netherlands) in 2016. This partnership is expected to benefit both the companies to exchange information as well as conduct experiments to understand the effects of LED Lighting on a variety of red roses and other crops. Philips offers its horticultural lighting solutions in all the major markets across the world with the help of its global distribution and servicing capabilities. The ever-growing population in the world is generating additional demand for food. The food production is not met adequately through indoor farming due to the changing climatic conditions. However, the technological advancements in grow lights are helping indoor farming to efficiently increase the crop yield. Grow light systems are installed as a primary source of light for indoor farming, as natural light is insufficient or completely absent. Vertical farming is changing the outlook of food production. The increased use of LED grow lights is encouraging the cultivators to adopt vertical farming on a large scale. In vertical farming, plants are stacked in layers one above the other which helps in utilization of maximum space available. The consumers’ demand for high quality, locally developed food free from pesticide and other harmful chemicals is increasing. Many places in the world are facing space constraints owing to the said concerns, and the food prices are also high at these places. However, with the use of vertical farming methods, the yield can be produced even at a square foot area. It helps in harvesting a variety of crops for whole year in spite of the changing climatic conditions. Commercial greenhouses are constructed to practice horticulture in a protected environment to ensure an optimum yield. Greenhouses are designed in such a way that they can trap the natural sunlight and humidity and retain it, which makes it conducive to grow various types of plants. The plants can be grown either by using soil as a base or by using hydroponic technique. Plants grown in greenhouses are protected from external dirt, and with proper care, they can be protected from insects and pests as well. It helps obtain a greater yield in greenhouses and achieve profitability. Key players in the grow light market include Royal Philips (Netherlands), General Electric Company (U.S.), Osram Licht AG (Germany), Gavita Holland B.V. (Netherlands), LumiGrow, Inc. (U.S.), Heliospectra AB (Sweden), Transcend Lighting Inc. (U.S.), and Sunlight Supply Inc. (U.S.); and raw material suppliers such as Beacon Lighting India (India); end users such as Walters Garden, Inc. (U.S.), Green Sense Farms (U.S.), and Borst Bloembollen B.V. (Netherlands); and suppliers such as Shenzhen Juson Technology Co., Ltd. (China). What are the high growth applications for grow light market? 5.3.3.4 Legalization of Growing Marijuana in the U.S.
11.2.1.1 Some of the Major Manufacturers of Grow Lights are Located in the U.S.
13.8 Iwasaki Electric Co., Ltd. Figure 61 SWOT Analysis: Gavita Holland B.V. Figure 62 SWOT Analysis: Lumigrow Inc. Figure 64 Company Snapshot: Iwasaki Electric Co., Ltd.